We are part of a class blogging challenge, and our partners are waiting for us. What is a blogging challenge? A blogging challenge is a set of activities that help us make our class blog better and help lead us to our own blogs. We get to meet other bloggers and learn from them. All the while, we practice our best writing skills and our netiquette. The Blog Challenge Checklist: Check here for make-up and to see that you have completed your activities. 4/19 Go to our blog: Eagles Write Complete the challenge comment based on what you have read. Blog Challenge A: Why should people visit our blog? Blog Challenge B: What should we add/delete to our About page? Blog Challenge C: What interesting blogs did we read? Blog Challenge 2: The Topic: Sharing about our class, our blog, and our avatar. We need an avatar for each class. You may also make one for yourself. Once you are starting to create online, you often need to have a special identity. This is usually in the form of an avatar. You may have them in Facebook and, of course, you have them when leaving comments on blogs. You see them when you make comments and the blog you are visiting chooses one for you. So, this week’s activities relate to avatars and online identities including creating a positive digital footprint. Step 1. 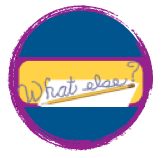 Create an avatar for your blog and for you to use when leaving comments. Avatars are a representation of yourself. Check out this post about avatars. Create your avatar using one of the websites below. Many of the sites mentioned below are included in her post. Most important is remember to save as a jpeg file if using Edublogs. So you decided to create an avatar like “Build your wildself” or “Wimpy Me." You need to take a picture of the screen first. On a Mac, hold down the command key, then hold down the shift key with it , then press the 4 key -- you will your cursor change to a "crosshair." Click and hold your mouse down to draw a square around your image. Let go of the mouse. You will hear a clicking sound of the computer taking picture of the screen. It will be on your desktop as a "screenshot." Double click to open it. Go to file save as and save as a jpeg with the the name "codepic." Now for some other changes. With your avatar open, go to Tools --> Adjust size. Make sure "Scale proportionally" is checked. Change the largest number height or width to 97 pixels per inch. Close your file. Then drag it into the Student Work file on the desktop -- just the main file, not your own. I need to get to easily and so do you. PC: Most computers have a printscreen button on the keyboard or if using Windows 7 you have an icon called “snipping tool”. When you press printscreen an image of your screen is now copied to your clipboard. You will still need to crop and resize to get an avatar that fits well on your blog. and click control V to paste your image from the clipboard. To save, you need to go to File>Save As> change the name of the file to yourname with ava eg sueava then underneath change the file type to JPEG. Make sure you save your avatar to your drive. Go to your drive, right click on the icon for your avatar image and choose “Open with” choose MS Picture Manager. In the icons at the top, go to View> task pane. On the right go to edit pictures > crop. Now move the black bars on the side of your image in, to crop your picture to what you want in your avatar. Click OK, then back to edit pictures. Now click on resize. In the box “custom width and height” put 97 in both boxes. These numbers might be slightly different but one has to be 97 and the other smaller than 97. Click OK.
Back up to file>save as> call it sueava2 or similar> make sure it is still JPEG. Make sure you have saved it to your drive again. Sue Waters from ‘The Edublogger‘ has written a great post about avatars, including giving instructions on how to save them and then upload to an ‘Edublogs’ blog.